The question is how do we create good jobs while protecting the environment? The answer is that we must strive to do both. We can only survive and thrive if we do both. Climate Jobs PDX was started by Jobs with Justice activists who were concerned about climate change, the lack of living wage jobs and the tension between labor and environmentalists. The threat of climate change is no longer in the misty future. In 2017, in the U.S., we experienced devastating hurricanes and fires – events that climate scientists have been predicting would become more ordinary. Feedback loops* are leading to unlimited further warming. The consensus of virtually all climate scientists is that we must now make an abrupt shift away from fossil fuels to avoid catastrophic climate change. *For example, as warmer temperatures melt glaciers, dark oceans increase in size, resulting in more absorption of the sun's heat and increases in global warming which results in more glacial melt. Thousands of workers have lost jobs and homes after hurricanes in New Orleans, Orlando, and Houston and fires in California. Two hundred thousand Puerto Ricans were forced off the island because of Hurricane Maria. Low income and people of color communities are particularly vulnerable to extreme weather events because of poor quality housing, precarious employment, and environmental injustice - living near toxic spills, chemical plants, and oil and gas refineries. Climate change negatively affects the health of workers (first responders, farmworkers, letter carriers, construction workers, factory workers) who deal with triple degree heat and smoke-filled air. In California alone, it's projected that in 2025 rising average temperatures will result in 2,100 - 4,300 deaths. And this is just the beginning. We can create a just transition that that rapidly gets us off of fossil fuels, while at the same time supporting good jobs, social and racial justice, economic equity and healthy, vibrant communities. We need an immediate 21st Century Climate Jobs program that prioritizes jobs for low income people and people of color; and provides for a just transition for displaced fossil fuel workers. These jobs would be in energy and materials efficiency, alternative energy, public transportation, electric vehicle production, and creating climate resilient communities. Important studies demonstrate the relatively low cost of investment in creating jobs that will protect the planet. The Center for American Progress report finds that private plus public investment of $200 billion per year would allow U.S. carbon emissions to fall by 40% within 20 years. (2) Private investment is good, but it is likely to fall far too short of what we need. Government policy has favored the fossil fuel industry with over $20 billion a year in federal and state subsidies and timid policies in dealing with the climate. Now the current Federal Administration is going 180 degrees in the wrong direction by ensuring that huge fossil fuel projects move full speed ahead, while attacking the Clean Power Act, and slashing budgets and subsidies for renewable energy. Shifting what is politically possible so we can achieve an equitable 21st Century climate jobs program is the significant challenge we face. To meet this challenge, Climate Jobs PDX organizes with other groups around local and state initiatives that will create climate jobs. These include Oregon's Community Solar Program, the Oregon carbon pricing legislation, and the Portland Just Energy Transition Initiative. In addition to creating jobs, these efforts will build the confidence and the grassroots constituency to reach further. 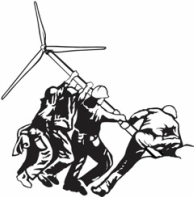 We bring issues and projects relating to climate change and climate jobs to unions and other groups with the vision of building the solidarity necessary to achieve a just transition.